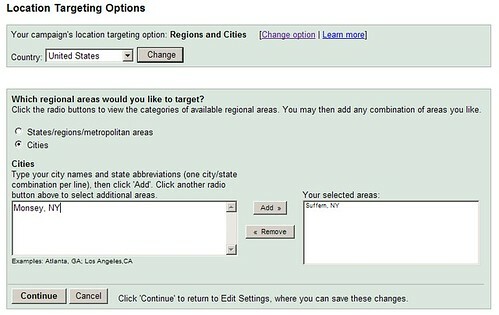 A HighRankings Forum thread asks if there's an easy way to geotarget to a specific city and not to a general regional area (like Orange County, CA). Indeed there is. There are many ways to target your ads, from countrywide (e.g. United States) to regional to citywide to a customized selection (for example, a 5 mile radius from Lexington, KY). Yes, Google AdWords is very customizable in this respect. Previous story: How Should You Handle High-Performing Keywords in Google AdWords?